Police in Greece have announced the arrest of 26 individuals in connection with an antiquities looting network that had been operating for 10 years. The announcement showed the recovery of more than 2,000 objects, including coins, jewelry, and other objects. Two individuals were arrested last Sunday at the Greek-Bulgarian border with an astounding 1,000 coins and small portable objects hidden in the bumper of their car. Police also confiscated metal detectors, guns, currency, and materials used to counterfeit currency. The arrests on Sunday were the culmination of a 14-month investigation which may have involved as many as 50 people. Nicholas Paphitis, Greek police break up gang that excavated, sold antiquities, US News & World Report (Oct. 5, 2016), http://www.usnews.com/news/world/articles/2016-10-05/greek-police-break-gang-that-sold-thousands-of-antiquities. Helen Stoilas, Police in Greece arrest 26 in bust of alleged antiquities smuggling ring, http://theartnewspaper.com/news/archeology/police-in-greece-arrest-26-in-bust-of-alleged-antiquities-smuggling-ring/. Education and economic incentives are probably the two most effective anti-looting “measures,” if they can be called measures. Education, because if people value the past for itself and think that it’s important, they don’t want to loot; and economic incentives, because if they are reliably prosperous without relying on looting, they don’t have to. Alternatively, you can try to foster the idea that an excavation itself and/or the tourism that it brings is a more sustainable long-term alternative source of income than a quick loot-and-sell operation. As far as I understand it, looting often isn’t that profitable a business for the looter: he’s giving whatever he finds to a middle man, who may be giving it to someone else, and him to someone else, until it finds a legitimate seller and a legitimate buyer who hasn’t dirtied his hands with any of the illegal activity. So, for the little guy, it’s dangerous – because looting is of course illegal – and he’s not making that much money off of it; he’s not going to do it unless he has to. If you can foster a good relationship with locals – providing them with employment opportunities, buying food for the project from within the village, some projects get students to teach English or organize pick-up soccer games with the workmen – those personal relationships are key to the long-term success of your project. But that’s kind of a warm and fuzzy answer that doesn’t deal with all of the complicated motivations that real people have in the real world. Realistically, what do we do? What can we do? The Gordion project employs a site guard year round who checks on the site. We give a map of the area to the local Jandarma, the police force, of the “most sensitive” areas archaeologically, that they need to keep an eye on. Also, in Turkey, sites that are looted or in danger of looting can be eligible for special “salvage excavation” permits. Near Gordion, several tunnels were dug into a large tumulus, looking for the burial chamber, over the past few winters. Last year, the Turkish authorities decided to excavate the tomb themselves, in a careful, scientific fashion with conservators on call – rather than allowing looters to make another attempt. The Gordion project was invited to contribute to the effort, which we did gladly. So, sometimes pre-emptive excavation is a necessary solution. And there are other interesting insights, so I look forward to reading the whole exchange. Practical change is slow in coming to the antiquities trade. There has been a renewed series of reports in recent weeks connecting the looting of antiquities to terrorism. This recent Guardian article quotes an unnamed intelligence official stating that ISIS (Islamic State in Iraq and the Levant) has partially funded its activities through looting antiquities from ancient sites, though it surely gained far more by commandeering oilfields. Also this piece by Heather Pringle for National Geographic does a good job profiling the work of the Trafficking Culture group at the University of Glasgow, but it cannot resist the big headline. The Nat. Geo. piece makes mention of some of the tenuous connections between insurgents, terrorists, and antiquities looters. I’m uncomfortable calling every insurgent a terrorist, and the connections which are made point to antiquities looting as being a very minor, if inconsequential aspect of the activities of these groups. Matthew Bogdanos, the Marine and prosecutor, has also publicly stated that terrorists loot as well though I’m not aware of specifics he can point to. The root for these connections may be this 2005 Der Spiegel article which again cites an unnamed investigator, this time a member of Germany’s BKA, as claiming that Mohammed Atta may have tried to use looted antiquities to finance the 9/11 terrorist attacks. This report, which contains little concrete information has had a longer shelf-life than it deserves, and has been used by a number of less-rigorous researchers, notably this piece authored by Noah Charney and two others which appears on the FBI website and breathlessly exclaims “[f]undamentalist terrorist groups rely on looted antiquities as a major funding source”. The data simply is not there to make this kind of connection, no matter how many clicks, headlines, or book sales it might generate. And making the connection is unhelpful. What’s the harm in connecting antiquities looting to the activities of terrorists, ISIS, and other unsavory groups? For one, it diminishes the importance of antiquities looting as an issue. These reporters and some in law enforcement make the claim because many politicians and officials who make decisions about prosecutions and allocation of resources do not make policing antiquities a priority. As many have pointed out, too many law enforcement agencies still treat art theft and looting of sites as a property crime. The efforts to connect antiquities looting to terrorism then is a way to bootstrap this issue on to other crimes which receive more attention. Chasing the looting/terror connection means that some heritage advocates can even attempt to lump collectors and museums into funding terror. This is an unfortunate trend, and one which I think does the heritage community a disservice and lessens the level of intelligent discourse. Imagine a terrorist network is apprehended and we know it received funding by looting sites. If the network is “dismantled” by prosecution or drone strike, the site is still there, still unprotected, and still not a priority. I suspect many terrorist and insurgent groups probably do engage in antiquities looting to some extent. But they engage in lots of other more lucrative criminal activity too. Just because hijackers may have visited strip clubs, played video games, or taken flying lessons does not make those activities “terrorism”. They are correlations without meaningful connections. Terrorists are the worst kind of criminal, and should be pursued and prosecuted as such. Likewise, archaeological looting is a serious and tragic crime which robs us of our collective cultural heritage. To attempt to make cheap connections between looting and terrorism undermines the cause and seriousness of the theft and looting. There are far more direct links between armed conflict and the looting and destruction of sites, we should perhaps focus our energy there. If we want our politicians and law enforcement agencies to take heritage crime seriously, we need to work harder to make them pay attention with real facts, losses, and data and avoid chasing tenuous links which are dramatic but have little chance of producing sound long-term cultural policy. The links may exist, but those interested in preserving antiquities should dial back linking the looting of sites with terrorism. Qualitative empirical studies of the illicit antiquities trade have tended to focus either on the supply end, through interviews with looters, or on the demand end, through interviews with dealers, museums and collectors. Trafficking of artefacts across borders from source to market has until now been something of an evidential black hole. 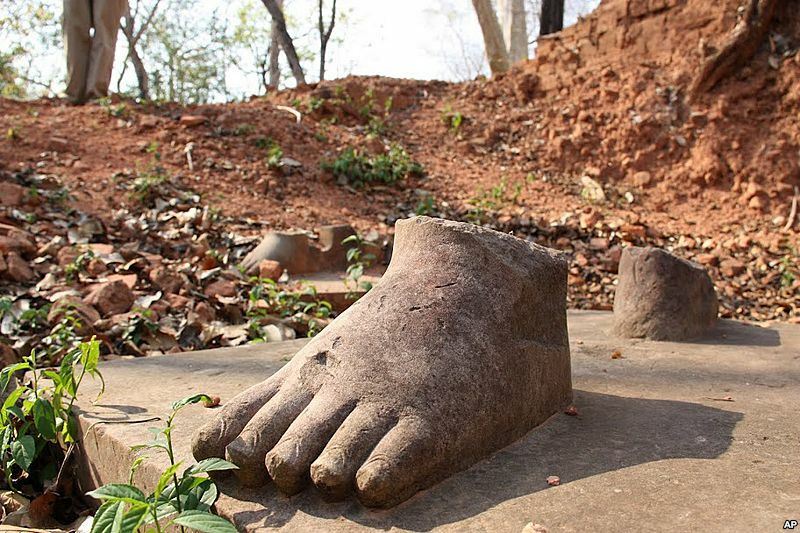 Here, we present the first empirical study of a statue trafficking network, using oral history interviews conducted during ethnographic criminology fieldwork in Cambodia and Thailand. The data begin to answer many of the pressing but unresolved questions in academic studies of this particular criminal market, such as whether organized crime is involved in antiquities looting and trafficking (yes), whether the traffic in looted artefacts overlaps with the insertion of fakes into the market (yes) and how many stages there are between looting at source and the placing of objects for public sale in internationally respected venues (surprisingly few). Since Clemency Coggins criticized the looting of Maya sites in an influential 1969 article, there is a rich tradition of young archaeologists criticizing looting and destruction of sites. PRI continues its excellent reporting of looting in areas in the Middle East by speaking with Emma Cunliffe, an archaeologist who has been tracking the destruction and looting of sites in Syria using facebook feeds and Youtube videos. We don’t just hear anecdotal stories of looting anymore, often times if someone has a phone or suitable camera, we can see video as well. Every day she goes online, sometimes for a few hours, to monitor the Facebook feeds of local Syrian groups for word about damaged sites. She’ll scroll past horrific photos of dead children till she comes across mention of a new archaeological site that was shelled or plundered. She says it’s incredible just how much you can find out from these posts. “It’s a new world online now,” she says. 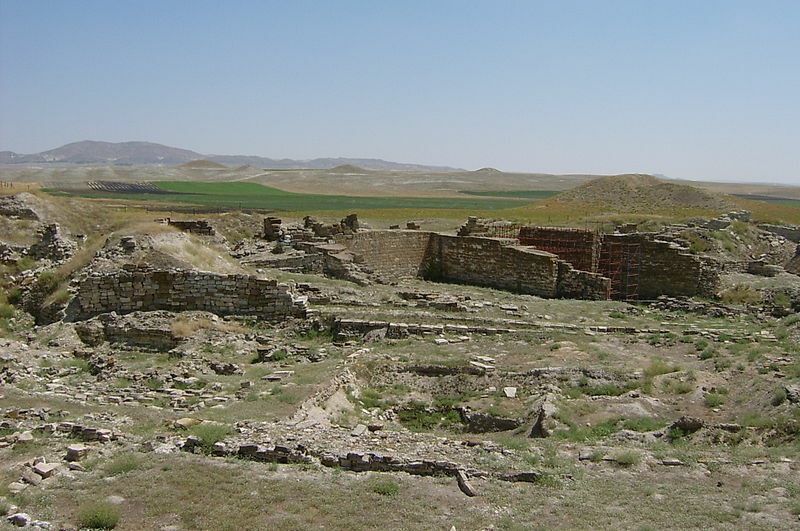 “The prevalence of social networking sites like Facebook, ease of access to YouTube, and the way that most people’s mobile phones can take video, means that, all those people who are desperate to share information have a real easy way to upload it and make it accessible.” Cunliffe did her Ph.D research on monitoring Syrian archaeological sites with satellite imagery. When fighting turned fierce in Syria, she began to consult imagery much closer to the ground – videos and photos posted by concerned Syrian citizens. 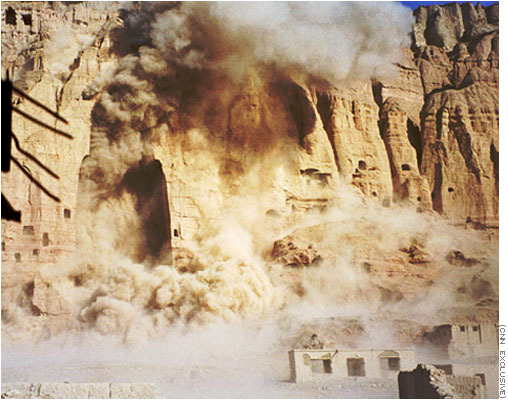 Sites were being damaged and also looted. Clemency Coggins, Illicit traffic of Pre-Columbian antiquities, 29 Art J. 94–114 (1969). Daniel Estrin, Why One Researcher is Documenting the Damage to Syria’s Archaeological Sites PRI’s The World (2012), http://www.theworld.org/2012/12/syria-archaeological-treasures/ (last visited Dec 13, 2012). Last Friday I finished teaching my art and cultural heritage law course here in Amelia as a part of ARCA’s masters certificate program. One of the highlights of my year is coming to Amelia for ARCA’s program, and the field class at Cerveteri captures so much of what makes cultural heritage policy a rich and interesting area to study—but there are frustrations as well. First the good. There are beautiful vibrant works of art in the houses for the dead. We met Stefano Alessandrini who took us through the necropolis and the tombs. 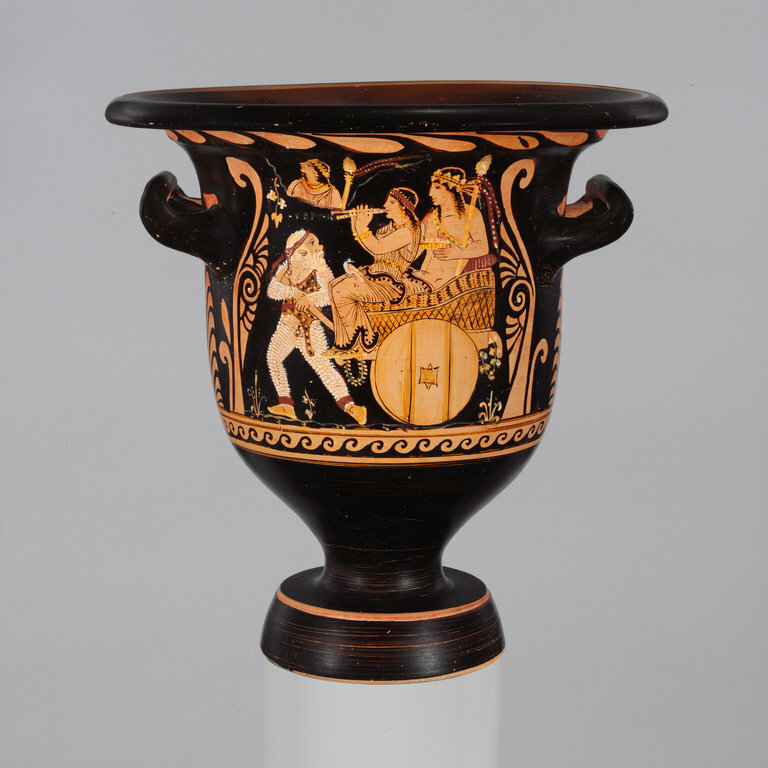 They now have names like ‘the tomb of the Grecian Urns’—where of course many Greek pieces of pottery were found. And the highlight is the ‘tomb of the reliefs’ with wonderful frescoes, bas-reliefs, and sculptures that portray a number of professions. The images are familiar and comfortable, except maybe for the image of Cerberus on the far wall. 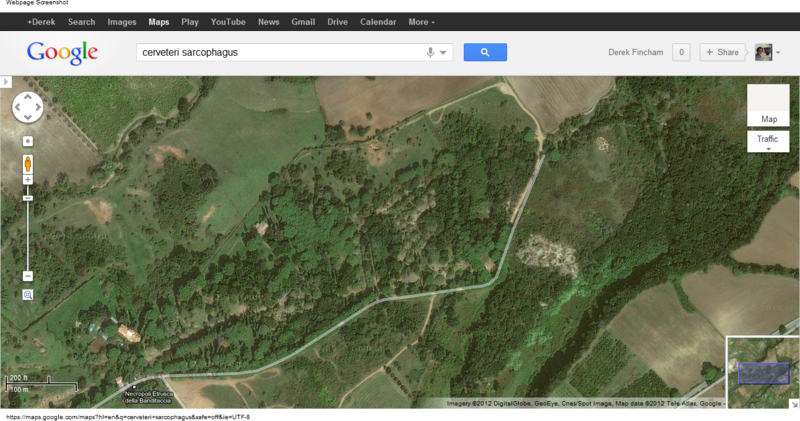 The burial complex was quite large, far larger in fact than the protected area of Cerveteri in the banded area. And outside of the protected world heritage site are tombs in need of conservation, some exposed tufo rock tombs, and also some vulnerable unexcavated tombs. You can see the area from this google maps image. To the right of the white line is the unexcavated or non-conserved area. To the left is the well-kept World Heritage Site. At the bottom of the hole you can see the outline of one of the tombs, likely a square tomb. So a looter may return at night and look for the entrance to a tomb. One difficulty is the remoteness of the field here. It’s just out of view of the little dirt track. On a dark night a looter could cover the hole with dark canvas and shine a flashlight underneath to do their work. Before the trip I assigned DH Lawrence’s short chapter discussing Cerveteri to the students. Though his scientific knowledge of the Roman and Etruscan civilization was lacking perhaps he did get the feel of these tombs just right. He travelled there in 1927 with a companion, and one imagines the little wine sink just off the main square is the same one where Lawrence popped in and complained about the lunch he ate before walking to the necropolis. But when he stops complaining about the food, the dust, the heat, and the Romans (the ancient ones), he describes a happy feeling walking among the tombs. He envisions the Etruscans thinking about a trip to the underworld. He suggested that the Etruscans might have burned their simple wooden homes (whether this is true or not I am not sure). But the point he draws from this writerly device gets the feeling of the place right. The Etruscans believed in a happy, joyous afterlife, which freed them to live in the moment while they were alive. And it is perhaps no coincidence that the time when Lawrence traveled to Italy and the Etruscan places was a time when Lawrence was diagnosed with Tuberculosis, and he might have been thinking about his own legacy and afterlife. What one wants is to be aware. If one looks at an Etruscan helmet, then it is better to be fully aware of that helmet, in its own setting, in its own complex of associations, than it is to ‘look over’ a thousand museums of stuff. Any one impression that goes really down into the soul, it is worth a million hasty impressions of a million important things. I guess we all have different views on our favorite way to see art. Walking through a large museum with many objects—millions might be a bit of an exaggeration—is certainly one way. 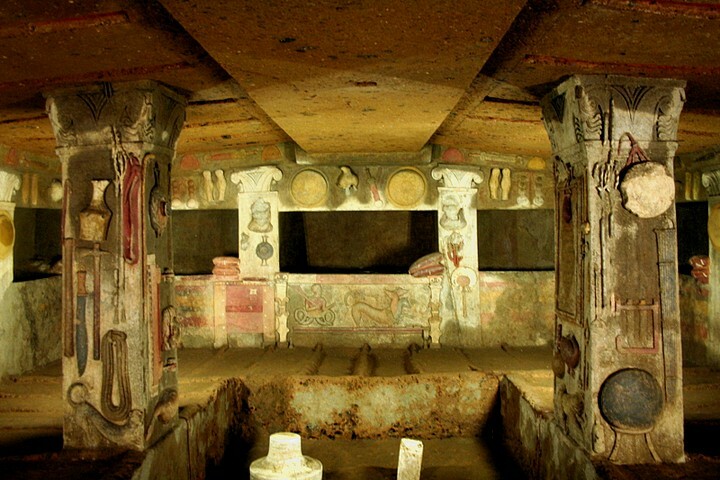 And pairing a trip to the Villa Giulia with a trip to Cerveteri in the same day offers a deeper different experience of seeing the tombs and the objects removed from them in the same day. We can argue about the value of both. But in making the decision, we should respect the law and regulation. Disagree with it, work to change it, work to strengthen it, whatever. But looting, even looting from the distant past, should not be used to avoid or end the conversation. The ad, produced by the Association of Greek Archaeologists, is most immediately a reminder of an armed robbery of dozens of artifacts from a museum in Olympia in February, amid persistent security shortcomings at museums across the country. But the campaign’s central message — “Monuments have no voice. They must have yours” — is a much broader attack on deep cultural budget cuts being made as part of the austerity measures imposed on Greece by the European economic establishment, measures that have led in recent weeks to an electoral crisis, a caretaker government and the specter of Greece’s departure from the euro zone. Effects of the cultural cuts are already being felt by the public, as museum galleries and sometimes whole museums suffer from sporadic closings. 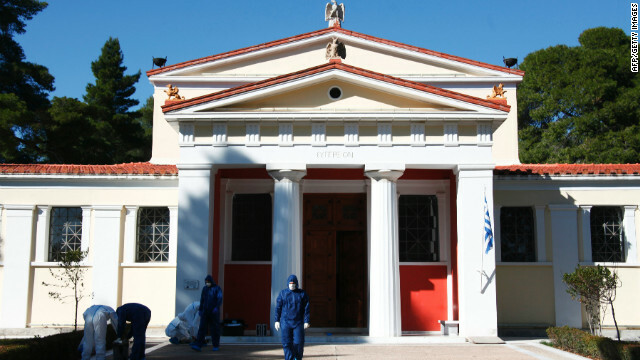 Despite the persistent claims that austerity played a role in that Olympia Museum theft, there has been no evidence of this, other than the circumstantial connection between Greek austerity and budget cuts and the armed theft early in the morning itself. We may be critical of the Greeks—but in times of economic hardship difficult choices must be made. And Greece is certainly not the only nation making those choices. Consider the Met’s recent decision to quietly deaccession some old masters, the Getty’s recent funding cutbacks, or even the Corcoran’s potential sale of its building in Washington D.C. Difficult choices for all of these cultural institutions have to be made. Kennedy’s piece does a fine job relating the perspectives of the Greek archaeologists affected. But is austerity a cause of the looting and theft? Or rather is it the thieves and looters who commit these crimes, and austerity provides them with a slightly more vulnerable target. We should perhaps remember that other arts reporters for the New York Times have a habit of travelling to the mediterranean and pointing out flaws in the cultural resource management of the Greeks and Italians. Consider this piece from Michael Kimmelman in 2009 criticizing the Italians and the Villa Giulia after the repatriation of the Euphronios Krater. Randy Kennedy, Archaeologists Say Greek Antiquities Threatened by Austerity, The New York Times, June 11, 2012, http://www.nytimes.com/2012/06/12/arts/design/archaeologists-say-greek-antiquities-threatened-by-austerity.html (last visited Jun 12, 2012).